With my first ever Clandestine Cake Club coming up, I wanted to have a practice run at baking the type of cake I was planning to take along. Fruit was the theme and Easter was the time (that I made this cake not the CCC one), so inspired by the cake on the cover of Issue 1 of Co-op Food magazine and with my new found passion for fruit curds, I wanted to make up my very own Easter curd cake. For this one I was going to use my apple and lemon curd. But, oh what a calamity! Creamed 225g unsalted butter with 225g cardamom sugar until pale and fluffy. Grated in the zest of a lemon. Beat in two large tbsp of apple and lemon curd. Beat in 1 goose egg. Folded in 225 sifted flour (1/2 wholemeal, 1/2 white) with a heaped tsp of baking powder. Stirred in 2 tbsp sour milk and 1 tbsp lemon juice. Spooned mixture into two 21 cm cake moulds and baked at 180C for 25 minutes. Left to cool for a few minutes then turned out onto wire racks. Instead, mine looked like this (or at least what was left of it after I’d tucked in). I can’t tell you how good the bits of broken cake were though, they tasted absolutely scrummy – especially when eaten warm. When the cake fell apart on me, I tried one piece and then another and then another – it was soooooo good. Deliciously moist it had a good dense consistency (not dense enough, obviously). It was hard to pick out a specific flavour, lemon was present, but not overly so. In any case it was delicious. Whilst the cakes were in the oven, I was making the filling – which actually became the topping! Melted 75g white chocolate in a bowl over hot water. Spooned some of this (slightly less than half) into the little chick moulds from Baked & Delicious and placed in the fridge to set. Creamed 75g unsalted butter with 125g icing sugar until very pale. Beat in the remaining chocolate. Beat in 2 tbsp apple and lemon curd and a couple of teaspoons of lemon juice. Spread this over the cake that remained intact. 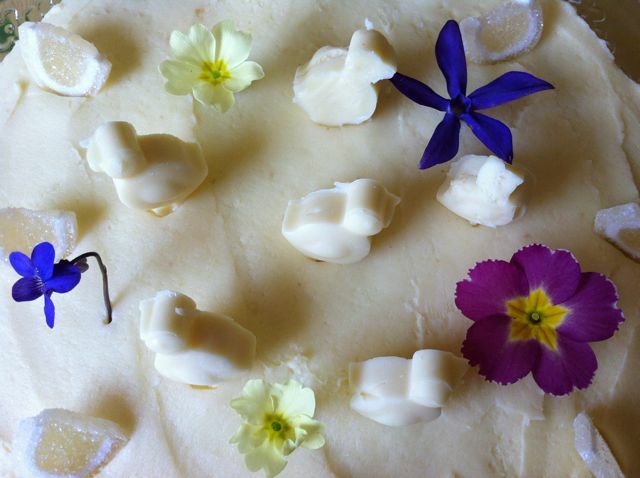 Decorated with lemon jelly sweets, white chocolate chicks and a few flowers from the garden. I was going to make a lemon icing to go over the top of the cake, but that obviously didn’t happen. Despite, the errr, mishap, this was a truly delicious cake and it didn’t deter me from making this with my latest curd recipe (yet to be revealed) for CCC. As the curd is made with lemons I am submitting this to the One ingredient challenge hosted by Laura of How to Cook Good Food who has chosen lemons this month. It’s alternately hosted by Working London Mummy where you can see the rules. This is so pretty – much more so than the Co-op cake. Lovely. Thank you Jennifer, that’s very kind. I am heartened by other peoples disasters as it makes me feel more human, so many thanks for sharing. I line the bottom of my silicone moulds too, although I find that small cakes are less prone to stickage. For something shaped I am too scarerd to bake without cake release spray incase it completel breaks up. Helen you seem very human to me! I always run a butter paper over the bottom of my moulds just to make sure and I’ve never had a problem before – don’t understand it at all. I haven’t tried any shaped moulds yet but I really ought to get some. Never mind about the cake. Unfortunately this is part of baking life. We all make cakes which do not turn out as hoped every so often but we learn from this each time. I have to tell you I have never been a fan of silicone moulds and I am sorry to hear about your mishap with them too, especially with such a fantastic sounding cake. I love the way you though around the problem and came up with a very good solution! The icing sounds so good, including curd & white chocolate, must have been really citrus with the added lemon juice too. You are not alone Laura, it seems the baking camp is divided between silicone fans and non silicone fans – I am in the former. Luckily, they haven’t let me down too often. Lemon is such a good ingredient, great one to pick and the icing was very good. Thanks for visiting and commenting and saying such nice things. Agree with you about crumbly, but then there is, err bits! It sounds like a delicious flavour combination and the cake looks delicious – dense enough to be moist and flavoursome but not heavy. Like Laura I’m not a fan of silicon bakeware, but perhaps haven’t given it enough chance yet. I think I had a bad experience with some badly designed moulds and gave up. I do still have some though. I hate it when things go wrong. Well, if I know that I’ve made a mistake that’s caused a disaster that’s sort of acceptable because I know what to change/put right next time (ahem, baking powder…) but when it’s unexpected or inexplicable disasters are very irritating. I do believe in sharing them though, and at least in your case you still had one layer intact and it was a delicious cake anyway! Good on you for sharing this ‘disaster’ though I wish my cooking disasters turned out so well as yours as that cake looked delicious! Well the one half of it was fine, but it did seem rather a waste of the other half, which I just scoffed! Most signature dishes are disasters recovered. It looks great and I am sure tasted awesome. Oh what a pity. I hope you are not going to give up on it – worth another try? Janice, I didn’t give up and the one I took to CCC worked absolutely fine – phew! sorry happens dear, I have had some disasters too! but after all look really delicious!! Thank you Gloria, that’s very kind of you. I think all cooks have disasters from time to time, it’s just rather annoying when they occur. Oh dear! But the single layer looks pretty and ad long as the cake tastes good… you could have made cake pops or tea cup cakes! Or just stuffed your face like I would have!! Well yes, you’re quite right. The cake could have tasted horrible, but it didn’t thank goodness. I made it again using a different fruit curd for CCC and it was absolutely fine. I really hate waste and something has to be really really bad before I’d ever think of throwing it away. Thank you for your very kind words Kit. I should have made something out of the cake, but I didn’t – I just ate it! Oh Laura, that’s even worse than mine. That was good of you to make a second lot though. Yes, I went last month for the first time and go again this bank holiday Monday – really looking forward to it. Will be doing a post about it soon. Thanks Jac. Yes, I’m not sure yet what to bake for tomorrow’s CCC – I only had my first one two weeks ago. Luckily the 2nd attempt at this for CCC worked out really well – phew! I remember the weekend we both baked cake failures! It’s the taste that counts! Your curd sounds delicious and I love the decoration on the cake. Enjoy your second CCC – cant wait to hear all about it! Your version looks much prettier than the Co=Op one. I am not the biggest fan of silicone moulds. If I use the loaf mould, it tends to sag in the middle, and looks more like a barrel than a loaf. I think the silicone works better in smaller size moulds, like cupcakes. What a lovely thing to say Galina, thank you. you are right about the loaf mould’s they always sag. If I have now learnt to put it inside a regular tin. But my other cake moulds are brilliant. I’ve used them for many years and have no complaints.